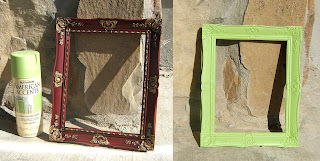 I have a bunch of picture frames from thrift stores that I'm going to paint all the same color. I plan to hang them in a bedroom with either a satin or a velvet ribbon. Most have to be sanded and stripped a little, but this one was plastic so he was the first to get tested. The color may appear different on each monitor, but it's a light, soft apple green color. Unfortunately there aren't a whole lot of great colors in spray paint at the local stores, so choices are limited.